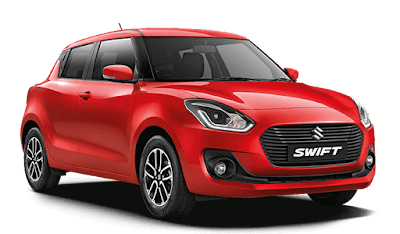 Maruti Suzuki has just launched its new model "Maruti Swift 2018" in red and blue color at the auto expo 2018.since 2005 Maruti Swift is the most trusted car in India.This time company improves few features like Projected headlamps, Keyless entry, infotainment system and many more features. Maruti keeps updating its model to catch up with rivals in the market. "Maruti Swift 2018" is fun to drive and have adequate power to thrill on road.In term of Exterior design: the Floating Roof Design and solid shoulder lines give muscular look to the body.It also has a Cut Alloy Wheels design that enhances its look and performance. *These prices are Ex-showroom Mumbai and can be varied according to your state. 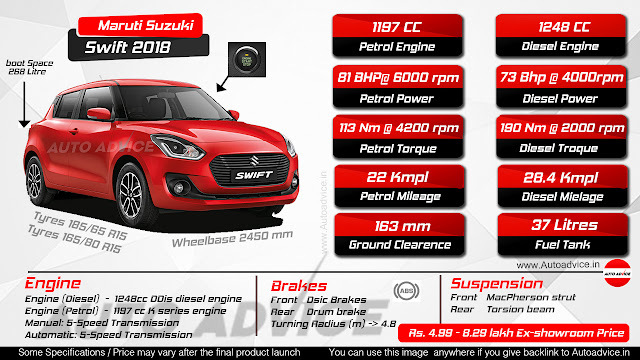 Maruti Suzuki Swift comes with two engine options 1197cc, 4-cylinder petrol and a 1248cc, 4-cylinder turbocharged diesel. Chassis is made up of high tensile steel.Both the engines are available with a 5-speed manual transmission as well as 5-speed AMTs (automated manual transmissions). The engines on the Swift are not the most powerful in their segment, but they are adequately peppy. It gives 22KMPL in petrol and 28 Kmpl in diesel variant.Which is best in class.The new DDis Diesel engine is more fuel efficient and more powerful.37 liter fuel tank capacity is more than adequate for a long trip. 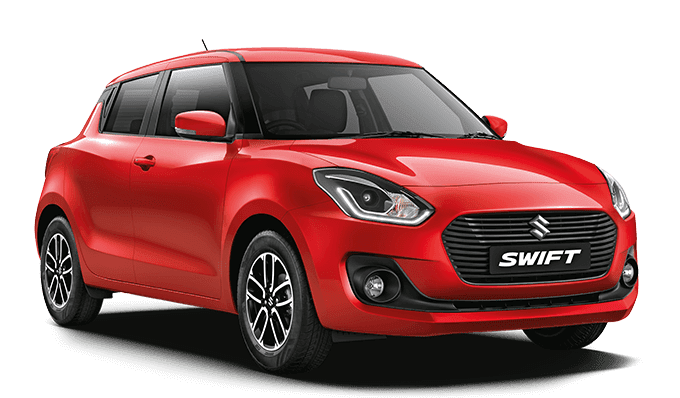 Swift 2018 is the most popular hatchback in the country.If you are a keen driver then swift is only for you.New Swift is fun to drive and has a peppy engine with very responsive chassis.Price is 4.99 to 8.3 lakh in India.It also has a very impressive mileage figure 22kmpl petrol and 28kmpl diesel.We advise you to take a test drive of Swift 2018 to decide whether it is meant for you or not.